Artists impression of CryoSat-2 in space. Image courtesy of ESA – P. Carril. Two interesting pieces of scientific research this week have looked at the changing aspects of both the bottom and the top of the Antarctic continent. As the Antarctic ice sheet is the largest reservoir of fresh water on the planet, it’s important that we understand what is happening to it as small changes in its mass may have significant implications for global sea levels. We are going to look first at what is happening at the bottom of Antarctica through a paper written by Konrad et al, titled ‘Net Retreat of Antarctic Glacier Grounding Lines’, published in Nature Geoscience Volume 11 and appeared online on the 2nd April 2018. The grounding lines in the title refers to the point at which glaciers that end in the ocean leave the seabed and begin to float. Changes in the grounding lines can indicate ice-sheet instability. However, these points are often significantly under water and difficult to observe, which is where remote sensing can play a valuable role. 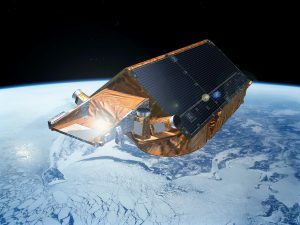 Researchers from the Centre for Polar Observations and Monitoring at the University of Leeds used satellite altimeter measurements from ESA’s CryoSat-2 mission alongside airborne surveys of ice geometry to produce a map of this boundary point. Cryosat-2 was launched on the 8th April 2010 and uses a Synthetic Aperture Radar (SAR)/Interferometric Radar Altimeter, known as SIRAL. It sends out bursts of radar pulses, covering a 250 m wide strip of the Earth and measures the time of the return signal to determine the height of the satellite above the surface. It can detect millimetre changes in the elevation of both ice-sheets and sea-ice, and the researchers converted these surface elevation rates into rates of grounding line migration. They found that between 2010 and 2017 the Antarctic lost 1 463 sq km of underwater ice. However, they did not find consistent loss across the continent. Whilst the retreat of Thwaites Glacier has sped up, at the neighbouring Pine Island Glacier the retreat seemed to have halted. The work of Konrad et al is part of a wider body of research that has looked at the amount of ice mass loss from the Antarctic glaciers. However, there has not been the same focus on the increase in mass to the continent from snowfall, which historically had been assumed to be fairly constant. Research by Thomas et al was presented at the European Geosciences Union General Assembly 2018, taking place in Vienna, Austria between 8th and 13th April, looking at this subject. The abstract titled ‘Antarctic snow accumulation over the past 200 years’ was also published in the EGU journal Climate of the Past Volume 13, issue 11 under the titled ‘Regional Antarctic snow accumulation over the past 1000 years’. In this work the team analysed 79 ice cores that had been drilled out from a variety of locations across the continent. By measuring chemical changes in the compacted snow within the cores they were able to determine that actually there has been a significant increase in snowfall in more recent times. The researchers estimate that the amount of snow which fell on the continent each year during 2001-2010 was ten percent higher than the same period two hundred years ago in 1801-1810. These findings are in line with scientific expectations of climate change. As the Antarctic warms, there will be more moisture in the atmosphere and so there should be a greater snowfall. These two pieces of research demonstrate the challenge of trying to measure and predict complex ecosystems like the Antarctic, where you have loss of ice mass which has to be assessed alongside the increase in snowfall. Currently, the ice loss is occurring at a faster rate than the increase from the snowfall and so the Antarctic continent is still shrinking! This entry was posted in CryoSat-2, Data, Earth Observation, ESA, Remote Sensing, Research, Satellite and tagged Antarctic, Antarctic Snow Accumulation over the past 200 years, Antarctica, Climate of the Past, CryoSat-2, EGU, ESA, European Geosciences Union General Assembly 2018, fresh water, glacier, grounding lines, ice, ice cores, Konrad et al, Nature Geoscience, Net Retreat of Antarctic Glacier Grounding Lines, Pine Isalnd, Regional Antarctic snow accumulation over past 1000 years, SIRAL, snow, Synthetic Aperature Radar, Thomas et al, Thwaites by Andy. Bookmark the permalink.